Here is a video showing off the unusual drawing table that I use when I make Space Base 8. I built a wooden frame around a fluorescent light ceiling fixture, topped it with a piece of frosted glass, then topped tat with 1/8″ thick whiteboard with a circle cut out of it. I took a round glass tabletop and set it into the hole in the whiteboard. This gives me a rotating drawing surface that is useful for drawing and painting. To find out why a rotating drawing surface on a light table is useful, watch the video! Hey, it’s another Rocket Ship Friday, youse guys! This ship is called the Angel Biter colony transport, and it comes to us from Mat Washburn, who does the webcomic Evan Yeti. A Yeti, a talking snowman, and a walrus clan with a secret weapon… what more could you ask for in a webcomic? Go check it out, what else are you going to do with all this time on your hands? Thanks, Mat, for this wicked cool piece of space art! RAY GUNS! ROBOTS! ROCKET SHIPS! 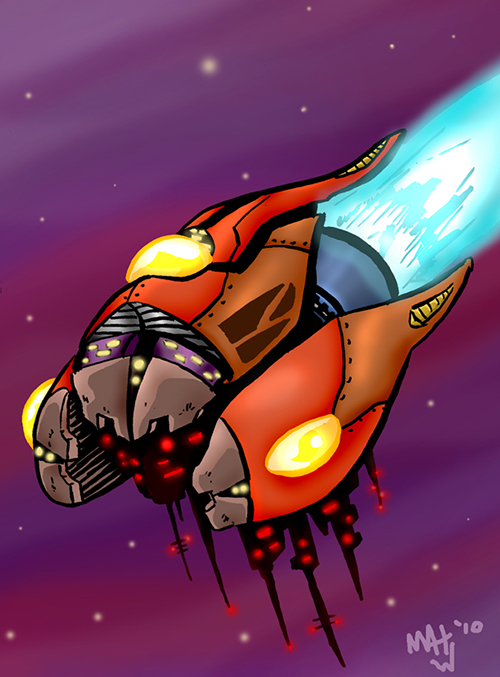 I want to feature your sci-fi art on Space Base 8! 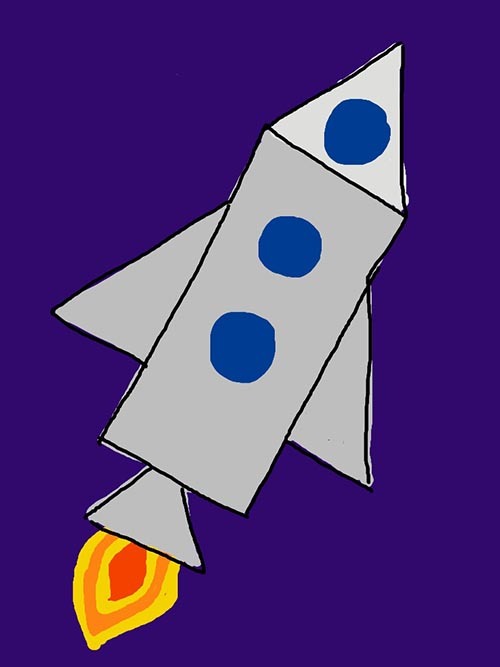 Email me your Raygun, Robot, or Rocketship art and I will post it in the blog for all the Space Base 8 readers to see. A sketch, a sculpture, a photo, whatever! Just as long as you made yourself. If you have a great Ray Gun, Robot, or Rocketship toy you want to share, that would be fun too! Email spacebase8@gmail.com, and include a picture as a jpg or png file, your name, and your website URL if you have one. We look forward to seeing your contributions! 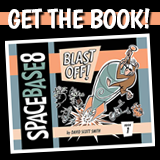 Did you know that there is a Space Base 8 book now available? It’s called Space Base 8 Book 1: BLAST OFF! 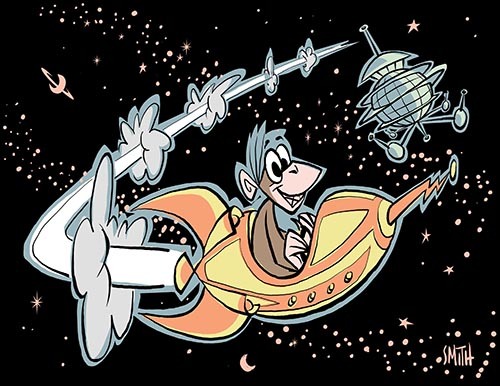 It collects the first year and a half of comic strips from Space Base 8. You can get a printed book, a signed artist edition complete with personalized sketch, or an ebook version. Click BUY THE BOOK in the menubar above the comic, or just click here to get your copy. Eric Scales is a rockin cool illustrator, personal friend of mine, and all-around fun guy. 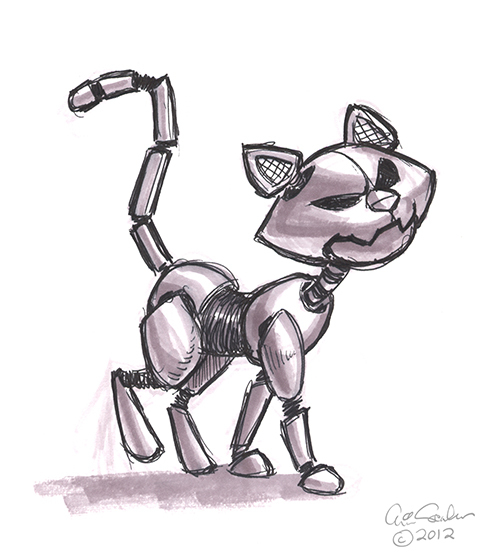 He drew a robot cat for Robot Wednesday. Check his blog, The Ol’ Sketchbook, for more awesome sketchynesses. Thanks, Eric! Hey! Here’s another bit of art from Danica Sevilla. Check out Wednesday’s robots by her, and check out the great post about Space Base 8 on her blog, Baring My Heart, too.